Pig Heaven: What Makes Free Range Pigs Different | Our Farm by Earth Flora Inc.
More and more people are loving our free range pork. The favorites? Pastured Smoked Bacon and Canadian Bacon, even our Smoked Farmer’s Ham. What makes our pastured pork products different? 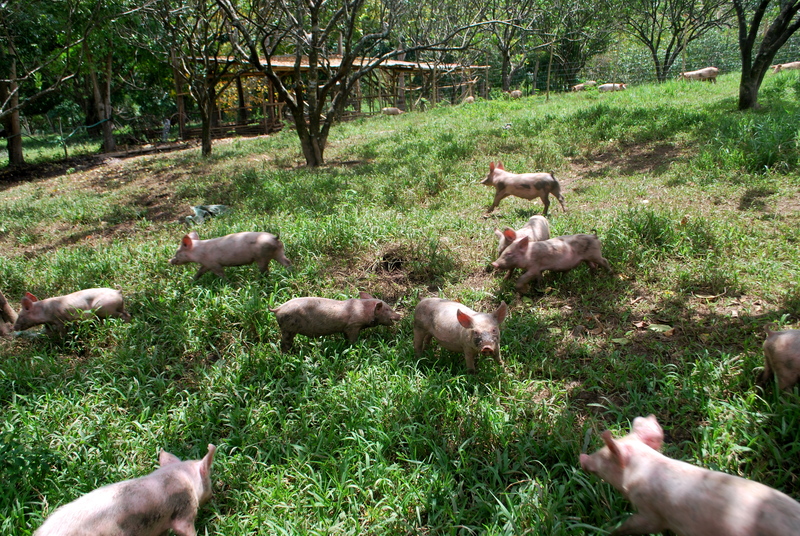 Our pigs live out their entire lives on pasture! Look at their 5-star pig pens! Our pigs are never crowded in small dark pens. They have access all day to vegetation and a lot of fresh air and sunshine. They even have their own mud pools! The pigs live happy healthy lives. Aside from what they eat out in the pasture, we give them cassava, copra cake, chopped greens and coconut meat. We do not feed them corn or soybean. We make the feed ourselves so we know exactly what the pigs eat! The pigs have NOT been fed animal by-products, given growth hormones or therapeutic antibiotic treatment. They have not been fed genetically modified corn or soybean. Our pigs get a daily dose of raw whey. This gives them a daily dose of probiotics, making them healthier and less prone to disease. Commercial pigs are raised to a size that’s good for the market, in barely 4 months. This is because of the heavy feeding of commercial feed, and because the pigs are kept in small pens, unable to move. Naturally-bred pigs or natural pork are from swine that are raised also in just 5 months. While they have more space to move and fed chopped greens, they are still fed corn and soybean. This makes it possible for natural growers to raise their pigs to a marketable size in barely 5 months. DowntoEarth pigs take at least 10 months to grow! This is because of the feed we give them and because they are always outdoors. The duration is similar to the Iberian pigs in Europe, which are fed a lot of acorn (in our case, we feed them coconut meat). 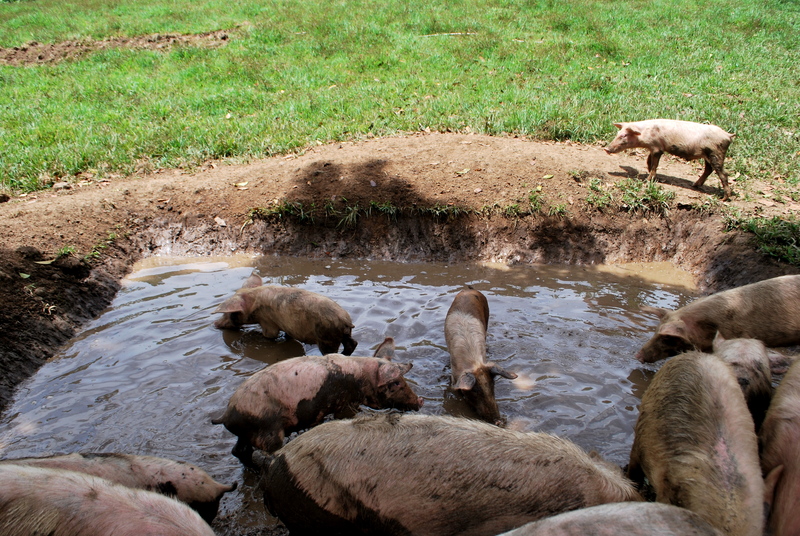 We follow slow food principles, and thus our pigs take so much longer to raise to a good size. Raising pigs on pasture adds real nutrients and flavor to the meat. A pig is by nature, born to root, dig, and run in pasture. And because they are able to live as nature intended them to, their quality of life is tops, and the quality of the meat is improved. Our pork is darker in color with good marbling. A darker color in pork means the meat has a higher pH score. A higher pH score relates to low cooking loss, better water holding capacity, loin firmness, less drip loss, improved processing quality and a richer flavor. Our version of Pig Heaven is definitely heavenly! DowntoEarth just does not raise pigs, we raise happy and healthy pigs. Check out our Pasture-raised pork products.